Here are five of my favorite products, that helps with keeping breakouts at bay, while lightening acne scares and making the skin look more even. First let me explain my skin type. I have very acne prone, oily skin with acne scares and I have large pores and get blackheads very easily. I have been fighting with acne since I was 11 years old, I have used all the prescribed acne treatments out there, even Accutane and I have finally found some products that works wonders for my skin, without me having to go to the dermatologist all the time, trying out new things that won't work in the long run. Even tough I have oily skin and use these products, I think they would work on dry skin aswell, because most of the products contain hydrating properties. You might think "Camilla, didn't you just say you have oily? Why would you add even more oil and moisture on your skin then?". Well... The reason why people get oily skin, is because the skin in the underlaying layers, actually is dry and our bodies are trying to add up to the dryness by producing more oil. Therefore it's important to moisturize your skin, no matter if it's dry or oily. The oil you skin produces is what can cause build-up, clogged pores and therefore acne, so it's also important to use product that can get the build-up off you skin. Vores Body Scrub is as it says, a body scrub, also called an exfoliator, but the scrubby parts are so fine, that it works as a face scrubs, and it's the best one I have ever used. The reason why exfoliators are great at preventing new acne from popping out, is that by exfoliating your face once a week, you get all the dead skin cells of your face and remove any dirt and build-up from you pores. Just be careful with exfoliators if you have active acne on your face, because that can make the spots more irritated. Kiehl's Midnight Recovery Concentrate is a completely magical product. I have been using this product for a little over 3 months and this product has rehydrated by skin so much, that it's doesn't produce as much oil anymore, which has calmed down my acne. It has overall made my skin fell so happy, fresh, and hydrated and you don't have to use much of it, so it's going to last for a long time. I'm guessing about a year. Definitely my favorite out of all these products. Origins Drink-Up Intensive Overnight Mask is a hydrating mask, that you apply to your face, instead of your moisturizer and wear overnight while you sleep. In the morning your skin will have soaked up all of the mask, and leaves your skin smooth and soft. 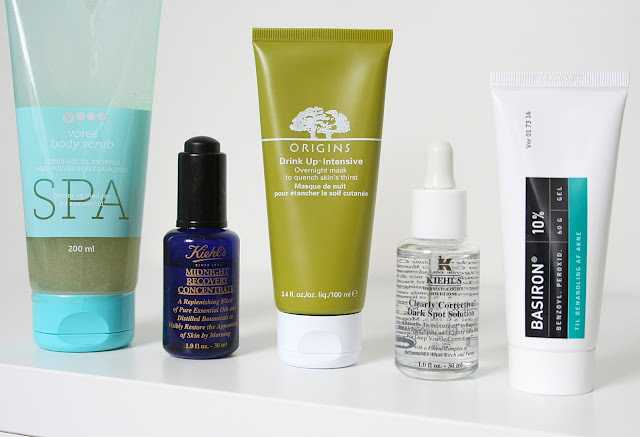 It's definitely great to apply once in a while, when your skin needs a bit of a 'pick me up'. Kiehl's Clearly Corrective Dark Spot Solution is a morning and night serum, that will help lighten your acne scares and even out your skin tone. I have using this for a week or two and before I bought it, I did some research to find out how good it is. Everyone says, that it is a miracle product and just after 3 days, you will notice a difference in your skin. I used it the first night, and was amazed in the morning, the redness in my skin was severely less red and my acne had calmed down. 3 days past and my skin was completely clear. Now after however long I have been using it, I have gotten some new acne spots and this product has helped lightening the scares faster than they would on their own. Barison 10% - Benzoyl Peroxide 10% is an active ingredient in some acne products. The picture of the product I have, is of a Danish version, but I know that AcneFree makes a product called Terminator 10, that contains the same active ingredient. These types of products helps kill the bacteria, that causes acne, therefore you can apply this directly onto you spots, which will dry them out, make them heal faster and prevent any new spots from popping out.